Located in the Montreal Woods subdivision in Tucker, 1401 Juneau Court is a 3 bedroom 1.5 bath renovated brick ranch. The kitchen has been totally remodeled and the living room expanded. There is a landscaped front yard, a patio, and large, fenced backyard. According to the owners the home is about 1450 square feet. Ask your agent if this is true: Do some sellers intentionally set a low price when they want to sell quickly? It does not happen often, but the answer here is "yes". Priced at $174,900 to bring instant attention, this home won't last long on the market. And you will perk up just knowing this is the personal residence of an architect because this recently-renovated ranch home is a head-turner. In fact, between 2004 and 2011 the home has been transformed from an ordinary ranch into an open, contemporary sweeping space. Experience shows smart buys in real estate are all about location & this renovated brick ranch is less than 5 minutes from I-285, I-85, and Hwy 78. It’s less than 10 minutes from I-20. Only 5 minutes from Tucker, 10 minutes from Stone Mountain, 10 minutes from downtown Decatur, and 25 minutes to Midtown Atlanta. Originally built in 1963 and solidly crafted, the home underwent an extensive renovation process between 2004 and 2010. The living room has been expanded towards the front of the house and the new vaulted ceiling gives the space a grand, open feel. The new kitchen is about 50% bigger than the original one with new stainless steel appliances, wood cabinets, granite counter tops, a built in pantry and wine rack. Through the years many have dreamed of living in this part of town only to be frustrated with the older designs. Here, the 3 key rooms - the kitchen, the living room, and the dining space - totally work. It is worth the trip just to see the space. Intricate architectural features such as under-cabinet lighting, island niche spaces, columns and beams, and an open floor plan make this house feel contemporary and comfortable at the same time. 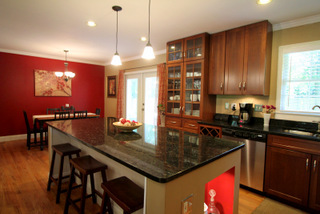 For the chef in the family - the kitchen was completely remodeled in 2007. The updated design includes plenty of cabinet and counter space and a large, granite island. You’ll love to cook and entertain in the living area and kitchen. The huge island, granite countertops and flowing floor plan make entertaining large groups a breeze. 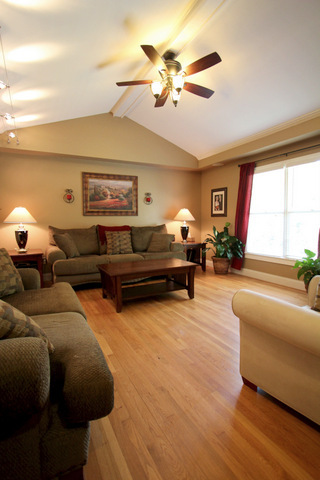 There are 3 bedrooms -- all are a great size and fit most furniture comfortably. All rooms in the house have received fresh coats of paint and 2-inch window blinds. The master suite showcases an updated, private half bath with new vanity top and hardware. In the back you’ll find an entertainment patio & a 6ft wood privacy fence enclosing the large, level backyard. The front yard has been extensively landscaped with a terraced retaining wall and several planters.